Boasting nearly 25 years of experience as a financial advisor, Brad Levin is passionate about providing a client experience that makes living with less stress a reality. His sincere interest in helping others find balance is evident in the time he spends listening and getting to know their hopes and fears. In the midst of these exchanges, he begins his most meaningful work, streamlining the details of a person’s financial picture so they can find fulfillment beyond a monetary amount. Brad’s approach to financial planning was shaped in large part by three major life events, the first of which was growing up with a single mother. Her incredible work ethic and her emphasis on saving became the foundation for his beliefs on investing in yourself and in your future. Today, he works with many men and women who share his mother’s attitude towards wealth, allowing him to create a path that connects their resources to their dreams. The second life event which has made an impact on Brad’s role as an advisor was his own divorce. During his separation, Brad discovered a lack of professionals who understood the ins and outs of dividing a martial estate and vowed to help those facing similar circumstances. He thus pursued an additional specialty in divorce planning, through which he reinforces the value of personal financial stewardship and delivers advice in an area that classically trained financial advisors are unequipped to handle. The third and final life-changing event occurred after Brad remarried. In 2015, his wife Jennifer was diagnosed and treated for breast cancer, causing Brad to become very involved with the underlying causes of cancer and the steps that can be taken to decrease the risks caused by lifestyle. As a result, Legacy Wealth Partners reaffirmed its focus on the pursuit of one’s passions and the importance of reducing stress, which studies have linked to multiple health consequences. Brad currently lives in Calabasas with Jennifer and their four children. His time away from the office is devoted to family, traveling, and engaging in physical activities of all types. Blessed in his career, Brad supports a number of local and national charities. Brad graduated from the University of California Santa Barbara with a degree in Business Economics. 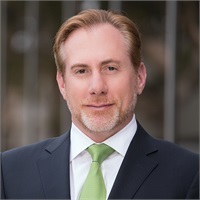 Prior to establishing Legacy Wealth Partners, Brad was a Vice President and financial advisor with The Householder Group and a financial advisor at Kavesh and Gau. In addition to working with clients one-on-one and overseeing the direction of our firm, Brad is a portfolio manager with a strong focus on technical analysis and is deeply involved in the management of our investment strategies. Designations as a CERTIFIED FINANCIAL PLANNER™ practitioner, a Chartered Market Technician®, and a Certified Divorce Financial Analyst, as well as Series 7, 24, 51, 63, and 65 registrations, set him apart from his peers because of the sheer breadth and depth of his knowledge.